I interviewed Jonathan Gabb, winner of the WW SOLO AWARD, for Jotta. It was one of the most illuminating interviews I have ever done, as there is far more at work conceptually in Gabb’s installations than is immediately evident. Jonathan Gabb has been announced as the winner of the WW Gallery’s inaugural SOLO award. 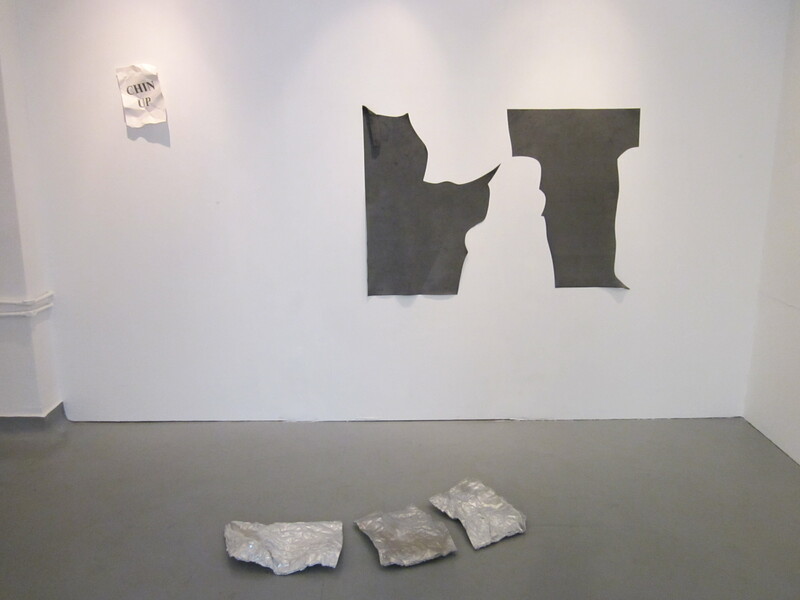 Jonathan Gabb will receive the prize money of £1000, a three month residency in which he hopes to create site-specific works inspired by the natural light of the gallery (something he has been deprived of in his own studio), and a solo show in January 2013. There is more to Gabb’s installations than first pleases the eye; it isn’t instantly obvious that these showers of colour take inspiration from the decorative elements of Art Nouveau or are working to achieve an effect similar to Baroque and Rococo architectural adornments. Gabb describes his work as “playing with reality”, admitting that his influences are as diverse Wayne Thiebaud’s Refrigerator Pies, where paint comes to resemble frosting on a cake, and Damien Hirst’s abstract yet arbitrary spot paintings. 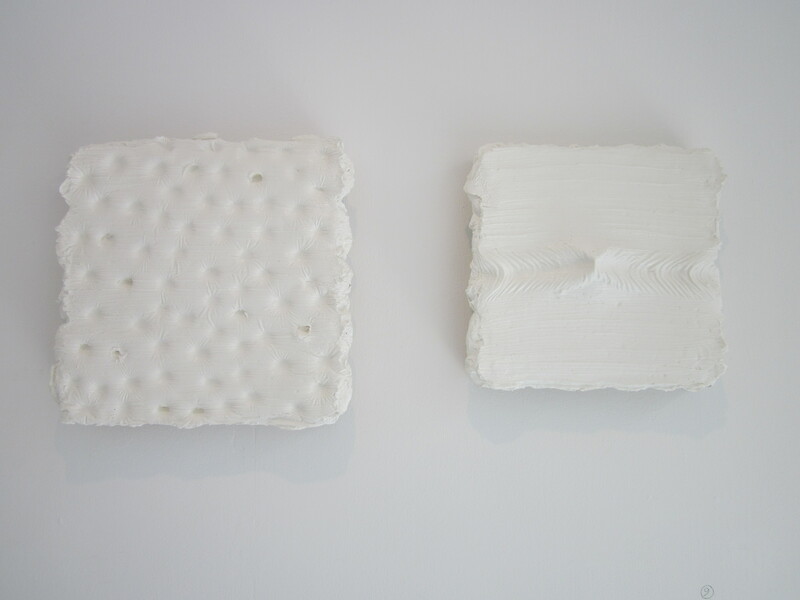 In a world filled with a persistent realism, Gabb’s work reminds us of the transformative power of pure materials. You have developed a very particular method of working with paint as though it is an object, how did you begin working in this way? I was introduced to this technique whilst on a life painting course, a PVA glue medium was mixed in with acrylic paint so that it appeared more translucent. Later on during my degree course I became interested in the act of painting and wanted to investigate the medium further. I loved how acrylic paint could maintain its plastic quality when the PVA glue was added and so I continued to experiment. I was interested in exploring how I could make reference to the act of painting in the works. By making sheets and cutting them into threads I was able to create forms which allude to drips and sweeping paint strokes. It is not necessarily obvious what exactly you are doing with paint just by looking, are you interested in confusing the viewer? It’s more about confounding the expectations of the viewer. With a painting, people expect paint on a canvas or pigment in liquid on a flat surface, I’m trying to do something different. I want to stretch the material value of paint in a 3D form in a way which transforms it into something else – the paint is freed from a fixed surface and can be viewed as an object. Audiences have a greater understanding about art now and I want to show something that not only has a lot of thought put into it, but which is also enjoyable to look at. I think there is something very authoritative about the traditional method of painting, and I think that ties in with people’s expectations. With these works people engage with the material nature of the medium, more than the colour, in a way in which they usually wouldn’t with traditional painting. 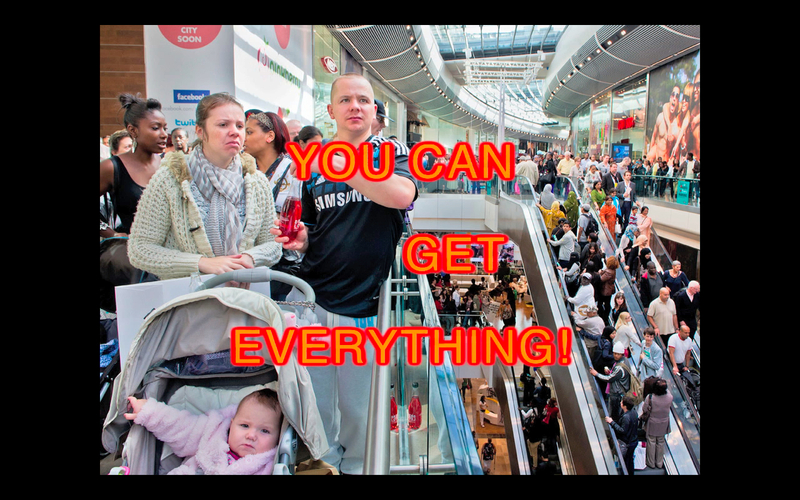 What effect does working in this way achieve which most interests you? I enjoy the optical element of the work; viewing the work becomes more of an event. The viewer can move around the work; from a side angle it might resemble a pen and ink drawing, then it merges into denser three dimensional forms at another point. 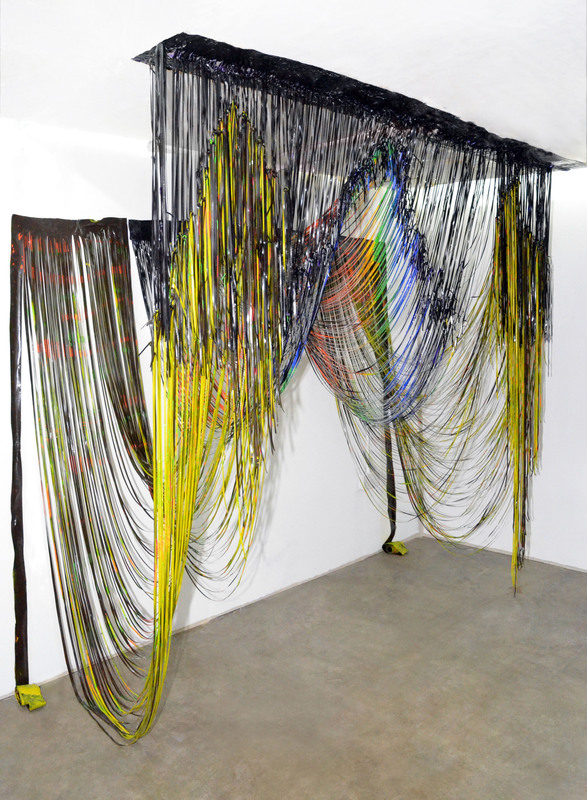 The viewer is encouraged to engage physically with the work. During my residency at WW I’d like to explore how I can create work which responds to the nature of the space and how the viewer will interact with the installations as they move through the gallery. 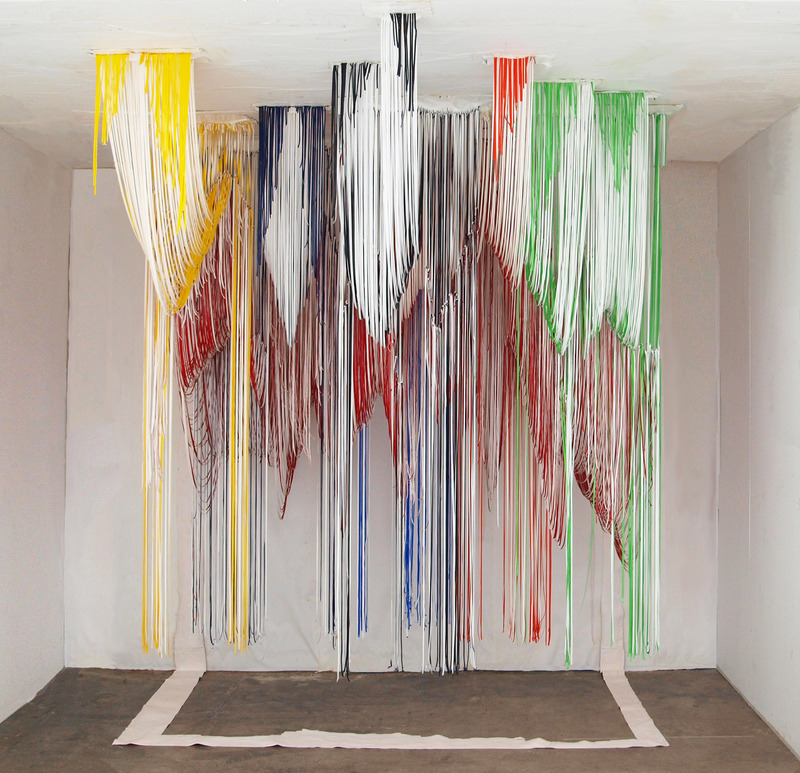 Are there particular colours or forms which you find most effective when you are making your installations, or are other elements the driving forces behind your work? My selection of colour in my more recent work has been consciously arbitrary. I like the idea of treating the raw material of the paint itself as a readymade, so I select the colours automatically. However I have enjoyed combining vibrant colour with the dramatic swirling forms of ‘baroque’ style compositions. 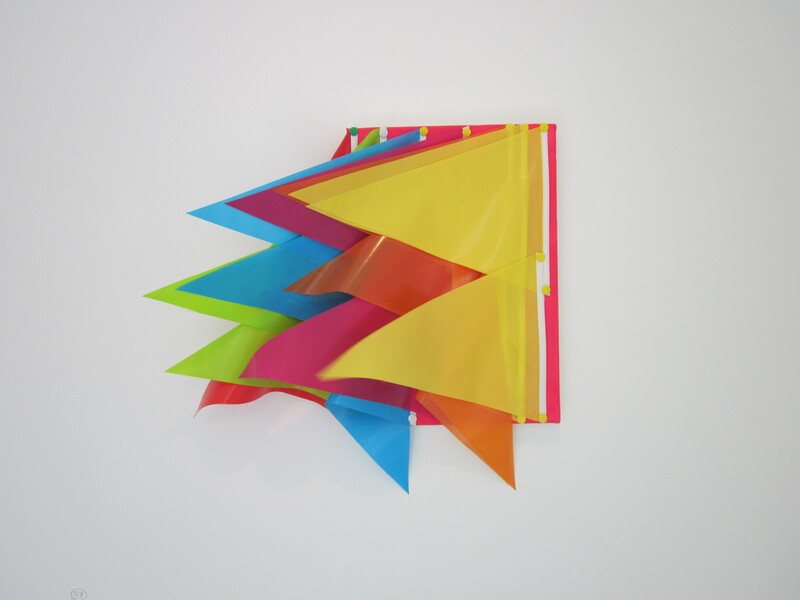 I also love the idea of celebrating the notion of abstract art as an ornament or decoration. The abstract expressionist paintings of the 1950s were meant to be the height of modernism, yet at the same time they decorated the minimalist architecture in the way an ornament would, despite being a contradiction to the ethos of the time. So these works adhere to the ceilings and walls in an unself-conscious way – like the adornments of rococo and baroque architecture. You can also read the catalogue for the WW SOLO AWARD group show online here: http://issuu.com/wwgallery/docs/ww_solo_award_show_catalogue_final_sp This is my first foray into editing and I put all of the texts together. The WW Gallery are delighted to present a solo show of works by Ayuko Sugiura. Working with sculpture and installation, Sugiura presents the viewer with a series of new skins, whether these are patterns projected onto a surface, layers of silicone, or tokens of identity; these illusory and visceral second skins present the viewer with an opportunity to question the invisible and intrinsic components of our cultural identity. Examining the instinctual nature of religion in contemporary culture, Sugiura uses arches, crucifixes and icons as the basic structure for many of her sculptures. These references, estranged from their context, become as difficult to identify as the influence of Christianity in daily modern life. The contemporary invisibility of faith; a sense of a belief in something whose shape and form we cannot identify, and who we can no longer give a name to, drives Ayuko Sugiura to search within her own lexicon as an artist for familiar textures and forms with which she can create a personal icon. Looking through a hybridised cultural skin confused by global homogenisation, Sugiura’s explorations of traditions, practices and cultures approach the uncanny. 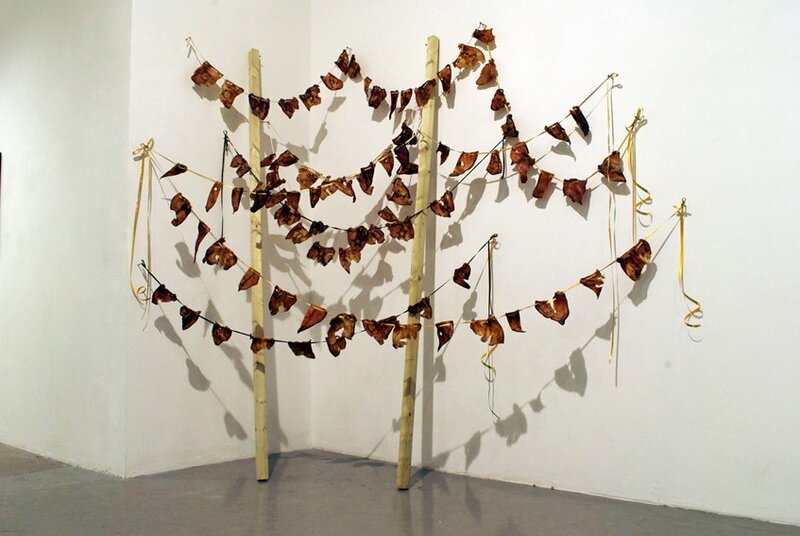 In her surreal use of familiar symbols twisted into an unfamiliar iconography, birthday bunting made from pig’s ears, silicone cathedrals and pink elephant crucifixes are all results of the clash of cultural references. Sugiura’s works become hybrid forms, distorting our preconceptions and transforming our inherited perspectives. Beneath the playfully surreal juxtapositions of materials and bright colours, there is also a more sinister element at work. The palpable legacy of sci-fi and psychological thriller leads the viewer to question how far the duality and multiplicity of identity, its consistently shifting form, is the realisation and revelation of a contemporary psychosis. 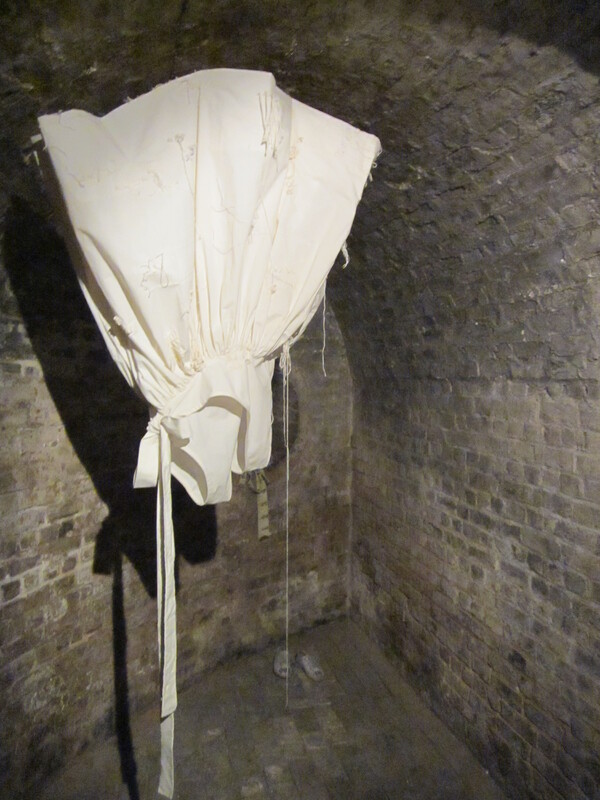 Last night I went to the opening of Crypta: Silent Monologue at the Crypt Gallery in Euston. It was the perfect end to a perfect day (Barbican architecture tour, finally talking with one of the participants of Tino Sehgal’s These Associations, the incredible TWEET ME UP by artist Tracey Moberly in the Tate Tanks and seeing the Tate Modern repopulated by London’s so-called subcultures). A space as distinctive as the Crypt is a curatorial challenge, but in the case of Crypta these difficulties have been used to frame the works in a way that only highlights their strengths. 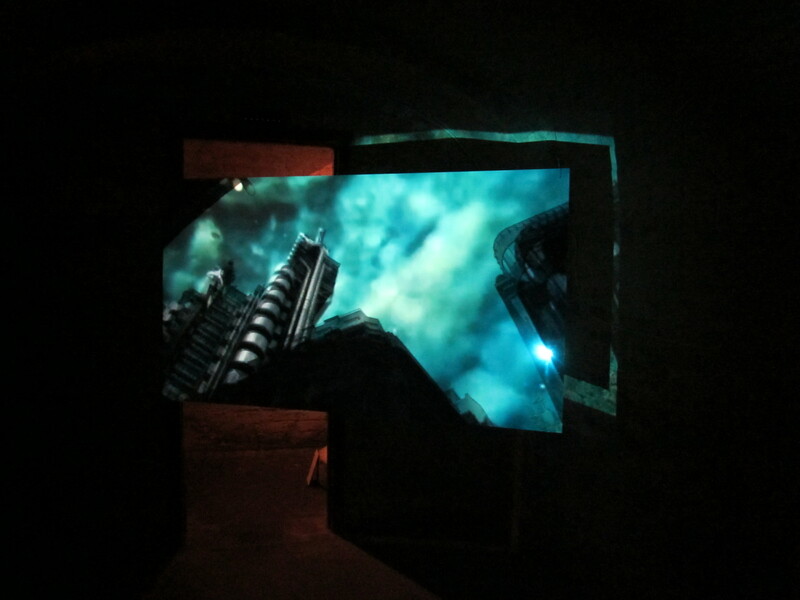 Katerina Georgopoulou’s video and print has a sublime ambience, heightened by its setting in this subterranean cave. The mixing of media creates a familiar yet frustratingly distant sci-fi reality, viewing from this perspective we watch a world which is entirely inaccessible and yet so enchanting. Kim Gladwin’s installation, complete with perfect business cards, was like something from the depth’s of Alice’s rabbit hole. A perfect white dress was hung upside down in an arch like the beginning of a fabulously magical realist story. Tugce Karapinar’s work caught my attention for its sentimentality; old family photographs under resin and precious diamonds made from memories scattered over a mirror. The diamonds were the most effective, obscuring memories in unidentifiable scraps, bleeding colours or glittering the way nostalgia so often does. Sandra Robinson’s Humans Born to Mice Parents reminded me of Rachel Kneebone, with more of an overt sense of surreality and less of the sweaty sexual overtones. Her mice-creatures were beautifully crafted and arranged amongst the dusty debris of the crypt. 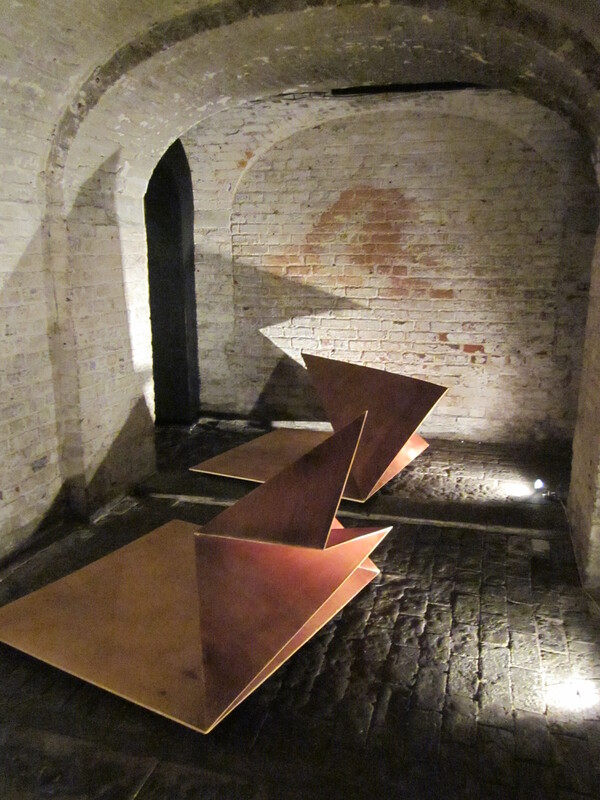 Marta Molka’s Flight Transformation occupied an incredible space at the back of the Crypt. Here, in the tunnel of the arches with the spotlights casting perfect shadows, these origami sculptures recalled a memory of landing in London from Poland for the first time. They made a beautiful landing strip of light and shadow and told a story which can so rarely be put into words. 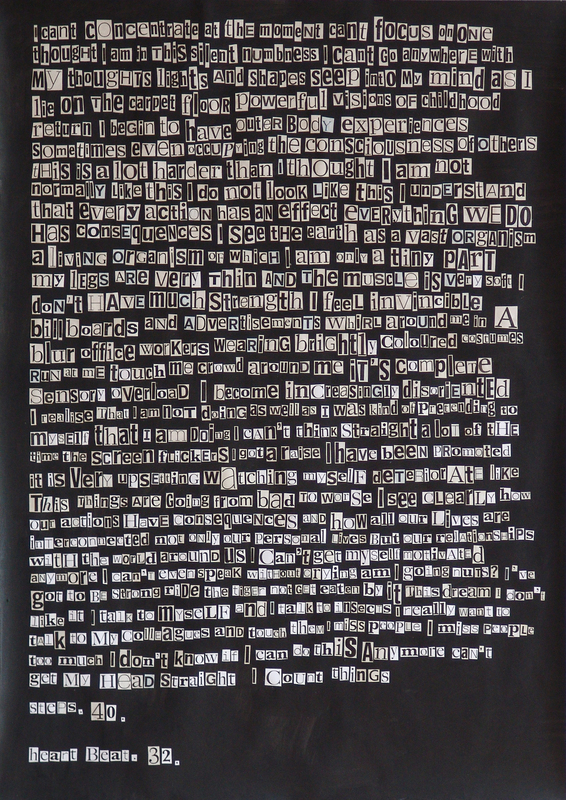 The exhibtiion is only on until the 29th August, so make sure that you visit http://cryptasilentmonologue.com/. There are only four days left to see the WW Gallery Solo Award, and the winner will be announced on Saturday. The exhibition has been very inspiring; the work of 37 artists longlisted for the show has overtaken the gallery, filling every possible space. It’s amazing to see what an open submission can bring about. 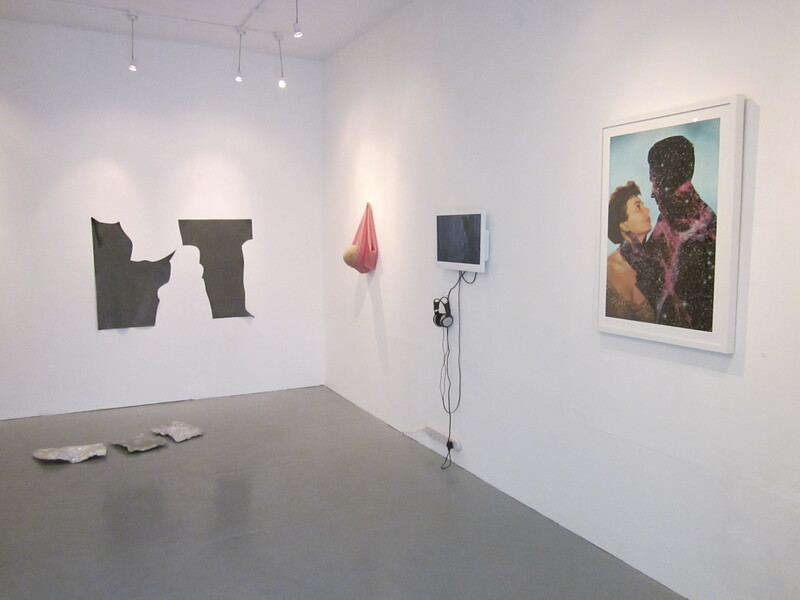 The GROUP show encompasses a range of media; painting, video, print, photography, a number of challenging experiments with paint, installation and some particularly stimulating examples of sculpture. There is such diversity, and yet the show feels very much like an exhibition. More than just a collection of interesting work, it has a unity which ties it all together. If you haven’t seen the show I can only recommend rushing down before it ends. It began to seem like all of London’s contemporary gallery spaces had closed for the summer, as though I would have to starve myself of interviews over the hot, wet British August days. Then I got a message about Sebastiaan Schlicher’s answerphone project. I made the call, I listened in confusion. Two recent encounters with contemporary art have made me think about how far we can define experience as ‘art’, or what kinds of experiences and reactions can still be labelled as ‘art’. It’s a fairly big question and perhaps my meaning isn’t at first clear. 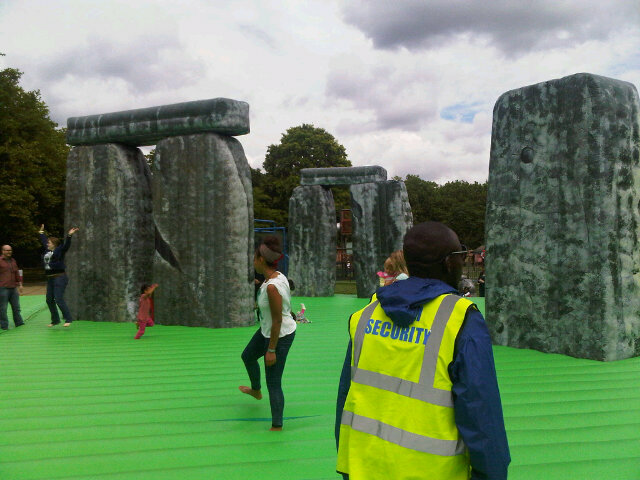 This week I worked at Jeremy Deller’s bouncy castle, Sacrilege in East Ham park in Newham. The bouncy castle was incredible, literally the biggest I have ever seen, and there was a constant swarm of children, adults and young people bouncing around, giggling and play fighting. Some people stayed for the whole day with the rare novelty of a free amusement. There were a crowd of twenty-somethings covered in knee-pads who had been following the castle around and seemed to be practising for some kind of new Olympic sport. As a social experiment/family day out I couldn’t fault Deller’s work. I can’t deny that Jeremy Deller’s Sacrilege was an incredible piece of human experience. It brought happiness, it brought a community together, it had all the Newhamites gathered in the park when usually they might have just strolled through. Everybody who came was pleased with Sacrilege. But although the rocks of Stone Henge were very well painted (I did stop to admire the detail on these springy standing stones) I couldn’t quite figure out what it had to do with art. The children and the parents all seemed unaware, Sacrilege’s bouncy irony passed them by. They were just enjoying the freebie, something to keep the children entertained during the holidays. I didn’t quite do things right, I was a little nervous and a little hesitant. I wanted the performers to approach me. But they hummed passed and jogged passed and I didn’t get to hear any stories. My failure to participate isn’t the point. What I wondered was if people telling an audience personal stories was art? Is the experience of confidence and confession, as isolated in the industrial Turbine Hall, art? Or perhaps it’s only the fact that an artist has organised it, that it is happening within the walls of a gallery, and that we are conscious of its afforded status as art, that means that we can define it as art? If you took away Jeremy Deller’s name from Sacrilege nobody would even be raising the question. Art has always been deeply connected to experience; the way a painting or a sculpture makes us feel is significant and intrinsic to the value of art. Yet I don’t want every single example of human experience to be defined as art, to be swallowed up by art’s expansion, so that I can’t unconsciously experience anything just as it is. 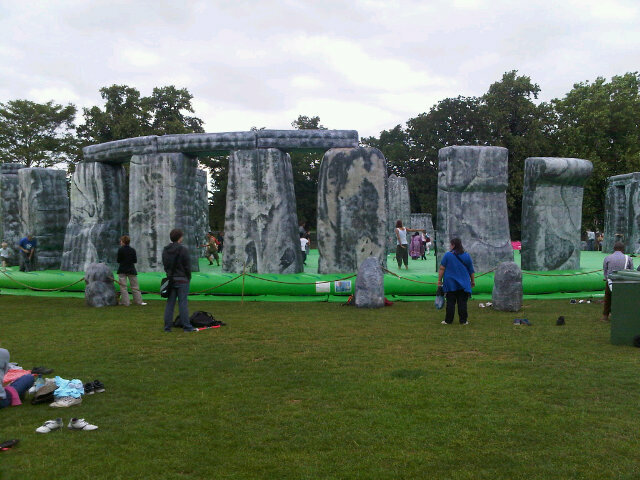 I suspect that Jeremy Deller’s initial artistic vision, the beautiful sacrilege of children and adults bouncing on one of our oldest monuments, has been lost somewhere along the way with the novelty of free fun. But I don’t want to be a spoil sport or stuck in the mud and say outright that the art world can’t claim Sacrilege as a victory. This month my article for the Hackney Citizen examined the real Olympic feeling outside of the official Cultural Olympiad. You can pick up a copy of this month’s issue or read the article here on my blog! The Transition Gallery looks out over a now iconic snapshot of East London; the Regent’s Canal with its own industrial rings reflected in the water, the trendy Broadway market running a counter-current to its right, and somewhere to the left,- out of sight beyond Victoria Park- the grand Olympic stadium. Taking into account the grimy traces of an industrial past and tangible evidence of regeneration and gentrification, the view from up here is decidedly positive. Indeed, Transition’s exhibition, The End of the Future, is the only positive vision of the Olympics I could find outside of the officially endorsed Cultural Olympiad. Taking her inspiration from the modernist belief that architecture really could change the way we live, curator Cathy Lomax really does believe that the Olympic redevelopments have made Hackney a nicer place to live. She wears her ‘Keep Hackney Crap’ badge as an ironic dig at all those cynics and disbelievers. Yet beneath The End of the Future’s nostalgia there is still recognition of the “unpalatable corporate aspect” which threatens us with the “broken dreams of past Utopias”. Playing on Michael Crichton’s 1973 sci-fi film Westworld, Scare in the Community’s exhibition at Xero Kline & Coma is an utterly dystopic exploration of the corporate consumerism of Westfield as a symbol of Olympic development. For curators Julika Gittner and Jon Purnell, Westfield is “a ridiculous new build with its Battenberg architecture, huge buildings designed to look like a city-scape , and its own postcode, E20.” Westfield is an island estranged from the reality of the existing community which surrounds it. The feeling of disillusionment in East London is in part motivated by a fear of the unknowable Olympic legacy. In Westworld Ben Seymour’s video, OLYMPICFIELD, envisions the Olympic stadium of the future as an overgrown high security prison where potential WMDs are being produced. The propaganda and conspiracy verged on hysteria with the Residence Gallery’s lecture from Dr Bill Aitchison, who believes that London 2012 signals the end of the world. 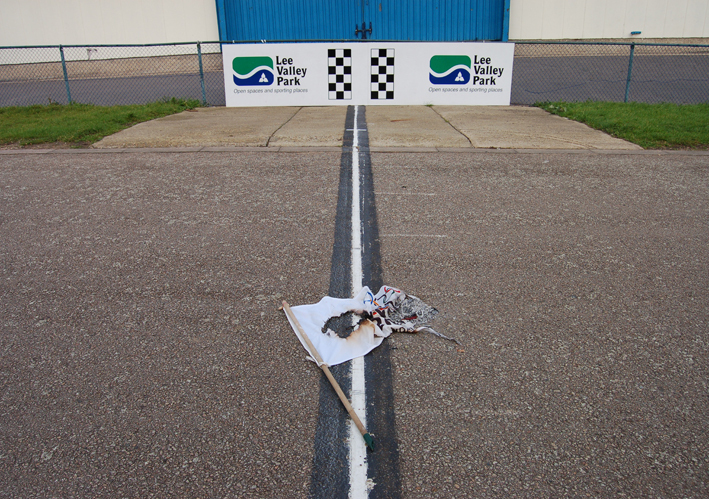 The One Hundred Year Gallery’s alternative opening ceremony, The Apocalympics, was similarly foreboding. While a group of galleries were meeting for a little while to make plans together, “this eventually dissipated.” Big names like Rachel Whiteread may have succeeded in winning a public commission, but all those works which were not officially endorsed by the Olympiad, are confined to the peripheries in an exhibition of ‘Failure’ at The One Hundred Years Gallery. It is this disregard for the existing culture of east London which justifies the vehement cynicism apparent in the tone of many Hackney galleries’ dystopian vision of the Games. East London is famous for its art scene, but the Olympics has brought in an unfamiliar, officially accredited programme of culture which masks our real identity with a public face and showcase for tourists. The Residence Gallery’s open submission exhibition, Botany & Botulism: The Olympic Legacy Zen Garden, has found the perfect metaphor for the difficult dual nature of the Olympics. Botany represents the beauty of regrowth, and Botulism, the hidden poisons which lie beneath the surface. Rent increases and the redevelopment of studio spaces have meant that artists have moved on, and struggling galleries and project spaces on the fringes of the Cultural Olympiad are unlikely to see the benefits of Olympic traffic. Perhaps when all of the official events are over we will find that botulism has spread. For Transition it will be the memory, the nostalgia of a golden sporting event that remains, but for many the Stadium is already a condemned wasteland. Ingrid Z hopes that “it will be artists who ultimately save the day when loads of empty spaces emerge in Stratford,” and then the artists and galleries will reclaim Hackney.